Learning to unicycle (just the basic forward riding motion on a flat surface) on average will take approx 10-20hrs to learn. I just want you to understand that there is a lot of falling off and getting straight back on the unicycle again. If you are not prepared to spend an hour a day for a couple of weeks, or persevere with lots of small 30min sessions, then it is advisable not to waste your money on a fairly expensive item that will sit in the corner of your shed remaining unused! Unicycle Seat Make sure your Unicycle seat is the correct height and also pointing straight ahead. When you are seated on the unicycle, with the heel of one foot on a pedal in its lowest position, your leg should be almost straight. Find a Clear Space Ideally a smooth pavement with walls or fences along one side, or a gym hall where you can ride along with the wall at your side. Make sure that you have removed any objects, as even little stones are enough to knock you off the unicycle until you gain a bit of experience! Find a Friend or Support If you can find a friend, then they can spot for you, which basically means that they can offer you support while you try to balance yourself onto the unicycle. Otherwise, you will need to find a wall, fence or anything stable to help you to mount (climb up on) the Unicycle. 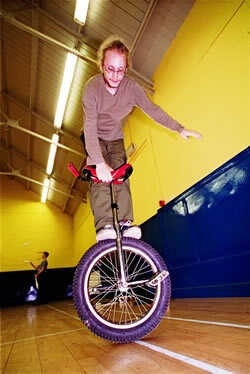 You should make sure that you and the unicycle are approximately arms length away from your support. Mount the Unicycle To do this, put your dominant foot on a pedal that at its lowest point (the other pedal is therefore at its highest point) and at the same time, put your weight on the seat. As you step up and slightly forward, this will cause the unicycle wheel to roll back underneath you and you are now ready to learn to ride! Throughout this whole move, keep all of your weight on the pedal nearest the ground. Safety Position – This is where both pedals are horizontally level (equal distance from the ground). The rider’s weight is distributed equally on each pedal and the unicyclist has the most control over the unicycle. When you are learning, always start and end in this position! Dead Spot – This is where both pedals are vertically level (eg one pedal at the bottom and one at the top). The rider’s weight is mostly on the lowest pedal, and it is incredibly simple to lose your balance or become stuck and unable to continue your ride when your pedals reach this position. When learning, the rider should attempt to smoothly move through this dead spot without stopping. Slowly increase the distances you travel such as trying to do only one full wheel turn, then working on 2 full wheel turns! Different methods work for different people! Also, you may decide if using a wall as a support to go along the side of a wall, or to head away from the wall and just see how far you can ride each time. It is entirely up to you, but I would suggest trying all of these ideas to see which one is most likely to work for you. Don’t Stay Still! Remember that because there are no brakes on a unicycle, that you can’t just simply stop riding and easily stay upright. If you need to stay in a certain area, then you are going to need to learn the idle trick (see further down this page). Lean Forward Try holding on to your support and lean forward slightly while pedalling. Let the Unicycle Fall! If the unicycle is starting to fall, then let it fall! You can injure yourself if you always try to catch the unicycle before it hits the ground, or just try and stay on one second longer! Simply pick the unicycle off the ground, get your pedals into the safety position and you are ready to try again! Think of falling off as great practice for learning to mount again! Centre of Gravity If you start to fall forward, you will pedal faster, bringing the wheel back under the seat. If you start to fall backward you will slow down, allowing the seat to catch up with the wheel. If you can keep your centre of gravity over the seat then you will have a much smoother ride! Don’t Look Down Look straight ahead when you are pedalling. This will help you to keep your centre of gravity and also help you to spot objects that might be in your way. Weight Distribution There should be as little weight as possible on the pedals as you ride. The weight should be on the unicycle seat. Learn Alongside Another Learner You can take turns at being the support, and you will know exactly what each other is going through! You can encourage and remind each other that it will take a good 10-20hrs to fully master the unicycle, but you can have a good time while you learn! If you teach Unicycling at workshops for children, then I would advise making sure the pupils use some knee pads, wrist guards (or at least gloves) and helmets. Jeans are not comfortable for riding in. Make sure that any shoelaces are tucked out of harms way from the pedals! They should have a clear space ahead that no-one else is allowed to walk into. The law seems to be very vague when it comes to the question of whether you are allowed to ride your unicycle on the pavement or the road. The law also seems to vary (when there is a law to be found) between Countries. In the UK at least, a Unicycle cannot be defined in any way as a bicycle, and therefore there is no mention of rules to follow in the Highway Code. The best advice is that if a Police Officer stops you on the pavement or road, then simply apologise, explain that you didn’t know any better, and move on! I wouldn’t recommend unicycling on a very busy road. Too many drivers will become distracted at what you are doing and end up crashing into things 😉 If anyone has better advice than this, please let me know as I can only go on my own experience, having been stopped on both pavement and road! The First Few Tricks To Master! Make sure that you can ride in a forward direction for at least the length of a gym hall unaided before you learning these tricks. Turning When you first learn this trick, make sure you look in the direction you want to turn. There are several techniques for learning to turn, so why not try them all and see which works best for you! Gently twist your body in the direction you want to go. Do not try and jerk the unicycle by twisting your hips suddenly to change direction as this can wear out the wheel and it doesn’t look like a good trick! Now learn to turn in the other direction! Free Mounting (getting on the Unicycle unaided) The Unicycle should be in front of you. Rotate the wheel until the pedals are almost horizontally level (with the pedal on your dominant foots side being just a little bit lower). With both feet on the floor, sit on the saddle as much as possible. Place one foot lightly on the pedal at the back (the wheel should not move yet). Lean forward and hop your other foot onto the pedal at the front as quickly as you can. Immediately push down with your dominant (front pedal) foot and begin riding forward! You can practice this move with a support just to get you used to the jumping up onto the unicycle and being able to ride off, but remember that this trick is called a freemount, and you are supposed to do it without any support! If you find that the wheel keeps rolling backwards as you attempt to jump on to the unicycle, they you could try placing the back of your wheel against a kerb. Dismounting There is a proper and graceful way to get off your unicycle rather than just falling off! 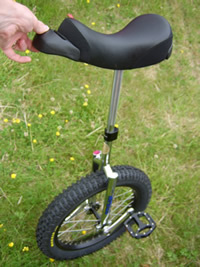 You can dismount by slowing down your unicycle, leaning back a bit, and putting more pressure on the pedal at the back. Just before the unicycle stops, step off the unicycle with one foot and then the other (either step off the unicycle forwards or backwards), and grab the unicycle saddle to stop the unicycle from falling to the ground! Idling This is where your unicycle stays on roughly the same spot by rocking the pedals back and forth. This is an essential skill if you are a performer, as otherwise the audience will have to follow you on your journey as you entertain them, as you will have no way of staying in the same area! The aim is for your body to pretty much stay in exactly the same place, while the wheel swings backwards and forwards underneath you. Sit firmly on the seat, look forward and move the pedals back and forth in a rocking motion. Note that one foot should be on a low pedal with most of your weight powering this pedal, and it needs to rock like a pendulum back and forth. The other foot will just be resting lightly on the upper pedal. Use the support of a helper or wall to begin with. Practice idling using your weaker foot also, as you never know when you might need to idle and you might not be able to do another half wheel turn to get onto your stronger foot! Given enough time and practice, the range of motion will decrease (eg you will not have to move the pedals as much as in the beginning stages to keep idling). Combine your idling skill with riding forward for a while, then idling, then continuing riding. Riding Backwards Once you can safely ride forwards and idle (which involves going backwards a little) then why not try riding backwards?! The main difficulty is how to see behind you so that you aren’t going to hit anyone or anything! Make sure you have a clear space behind you because if you have to turn your head when reversing, it can knock you off balance! If you enjoy Unicycling and begin using it everywhere you go, here are some useful lines from the much larger collection of one-liners @ www.unicycling.org on how to deal with people who try to be funny by asking “where’s the other wheel?”! It’ll be along in a minute. My other wheel? I don’t need a training wheel anymore! I got the bike on sale, half off…I didn’t realize they meant the bike. Don’t be daft, where would I put a second wheel? Ultimate Wheel This is the standard unicycle, but without a seat post or saddle! You definitely need shinguards before going anywhere near this unicycle! Impossible Wheel Also called a BC wheel. This is a plain wheel with the axle extended on both sides with posts. Because you have no pedals, you have to stand on the posts and roll along, which is pretty impossible for nearly all unicyclists (hence the name impossible wheel)! Monocycle / Monowheel This is a wheel with the seat inside! These are fairly rare. The wheel is a ring, usually driven by smaller wheels pressing against its inner rim! Multi-wheeled Unicycles Yes, you can have more than one wheel and still be riding a unicycle, as long as only one wheel is touching the ground! One wheel is on top of the other… This means that in order to ride forwards, you have to pedal backwards, which makes the top wheel go backwards, thus powering the wheel on the ground to go forwards! Of course, you could just get a three wheeled version which would let you pedal forwards! There is even a version with 13 wheels arranged like a series of cogs! It is actually easier to ride a giraffe unicycle than a standard unicycle (but please learn on a standard unicycle first)! You may be able to work out why by visiting my balancing objects tricks page.